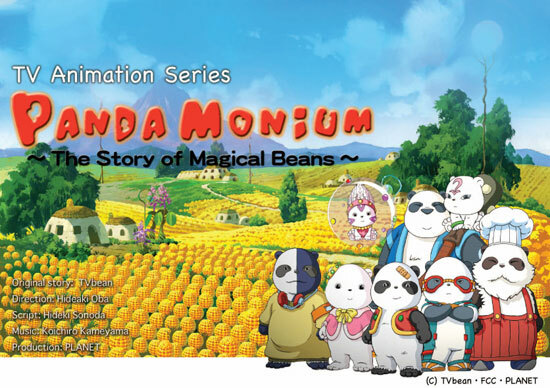 An adventure story of kind and friendly Pandalian Toby and his friends. Planet Karon where Toby and his friends' home is threatened by an evil force. Confronting the crisis, Toby starts his journey to find 8 warriors with magical beans to save the planet. The journey is never easy but full of excitement as all 8 Pandalians are so unique. They will experience a series of hardship but when they defeat the evil and save the planet, they become more caring and courageous Pandalian. And at the end of the journey, Toby's secret wish comes true when Love finally gives him a kiss. At first he does't have any special goal. He's just an ordinary young Pandalian boy. But in meeting up with different people (pandas!) he discovers his goal and starts to advance toward it as he grows. To save the Planet Karon from the threat of being ruled by the Evil King. Unraveling the legend of the seven magical beans and obtaining all of the beans. Turning his unrequited love for Love into mutual love! The twenty-six episodes will be divided into four episodes each (or five in some cases) to create a large-scale story with a total of 7 volumes, 3 sagas. In the first 8 episodes (eps. #1-8), Toby joins Karon TV and meets people with who eventually become his travel companions. In the second part (eps. #9-24), Toby and his friends take a journey to collect the legendary magical Beans as well as warriors to fight together with him against the evil king. In the final 2 episodes (eps. #25 and 26), Toby and his friends finally confront the Evil King, Luke.